It seems like just yesterday we were filing our tax returns are wrapping up the 2011 year (unless you’re Mitt Romney, who still hasn’t filed his 2011 taxes). However, there is no better time than the present to start thinking about ways to minimize your 2012 taxes. Because we all hate paying taxes, and there are definitely some easy ways to make it bite less! Here are some simple things to consider! If you are planning on investing for capital appreciation, consider doing as much as you can in a tax deferred account, to minimize the tax implications. Speaking of tax deferred accounts, these can be great ways to minimize your 2012 taxes. The main types of accounts are 401ks and IRAs, but there are a lot of variations that also qualify for tax deferred treatment. If you are planning on investing for capital gains, put your money here. Also, if you are investing in a large dividend paying stock or other cash flow investment, like a REIT, an IRA or other tax deferred account can be a great way to do it. While dividends are also treated in a different way, you could still face taxes if you don’t shelter them properly. Finally, if you can’t invest in a tax deferred account, you can still invest in tax advantaged investments. These are products that are designed to minimize your tax liability each year. A common type of tax advantaged investment is a municipal bond. If you buy a qualifying municipal bond or municipal bond fund, you are usually exempt from state and federal taxes. This can be a huge benefit. There are also tax advantaged mutual funds and ETFs, which keep portfolio turnover to a minimum, which helps prevent capital gains payouts at the end of the year, thereby reducing your tax liability. What other ways can you start minimizing your tax liability for next April? Like Mitt, we haven’t yet filed our 2011 taxes. But I think our reasons are a bit different. 😉 It’s a nuisance to keep tax affects and tax planning in mind year round, but I agree it’s important if you don’t want unnecessarily to give money away. I don’t mind paying my fair share of taxes of course–just wish so much of my time and effort weren’t required! I don’t think anyone minds paying their fair share, but there are so many easy ways to minimize the share you do pay! It’s hard to lower your tax liability but tax-deferred accounts are a great idea. I’m not a huge fan of muni bonds but they fit in certain scenarios. Sometimes you can’t always lower your tax liability, but when it comes to investing, there are a lot of ways to do it. Do you know if the 3.8% Obamacare tax is supposed to go up on RENTAL INCOME? I read this, but can’t be sure. If so, then I shouldn’t pay off my rental mortgage and use as much shield as possible. It will only affect individuals who earn more than $200k, or couples earning more than $250k AGI. Super bummer. 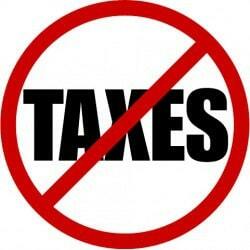 As a tax guy, I am not looking forward to the capital gains tax increases. We’ll have to re-work our tax planning strategies for some of our clients and make sure they don’t get hit with unexpected tax bills. I hate these pending laws, because they usually go into effect after the year is over and clients and compensate for it. I’m going with tax-deferred accounts myself, but who knows, they might take that away next. We just had our third child in early 2012, so our upcoming tax return should compute very nicely. 😉 I make a point to donate quite a bit each year to charities that mean a lot to me. Taxes aren’t my number one consideration, but I certainly do keep track of every little item so I can maximize that line item. ItsDeductible is my new best friend!